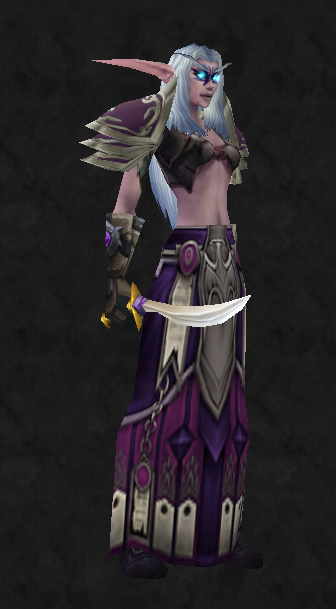 I love transmogging. I need to do it more. I spent a little while today coming up with an outfit idea for my DK, who actually doesn't get played much except to do inscription stuff. (I am hoping to get her to 85 before MoP hits, though.) But hey, you should look good standing around milling in Stormwind, amirite? Overall I like this outfit pretty well; I'll probably grab the shoulders at this month's DMF and start picking up the rest of the items as I go.